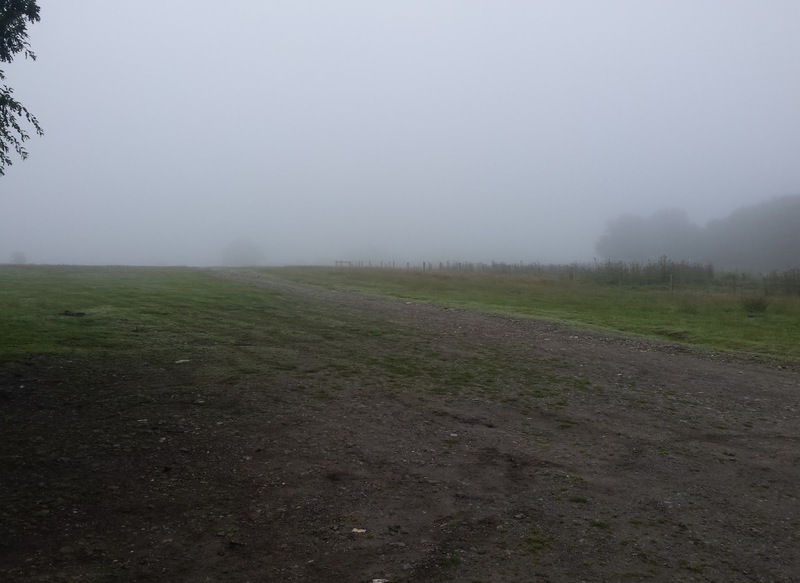 Whilst the last two days have been relatively quiet, weather wise, today a pronounced and very well predicted depression was due to arrive – the only question was – when? With bets being taken for 1000, 1200 and 1300, some (misguided) people thought it might be worthwhile getting in a morning’s flying before the rain arrived. Those thoughts were rapidly proved to be premature as precipitation arrived just as we were flashing up the generator. So it was out with the books, progress cards and weighing specs for an informal talk-in about anything and everything we could think of, in particular to prepare Dave Downton for next week’s Flying Week, before deciding that we really should spend more time with our families. A busy day today, with many trial flight bookings on the calendar and plenty of club members looking for check flights etc. 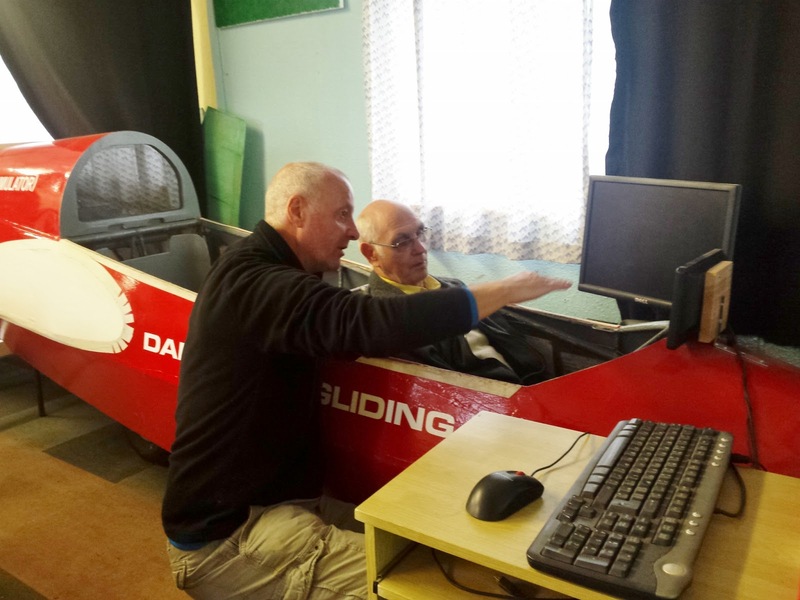 Initially hampered by K-13 HXP being the only two seater available, at lunchtime there was a very welcome message that, provided we sent reinforcements, DMX was repaired and ready for collection. Our One Day Course student was Jane Green, who flew with IFP Rick Wiles. That message fortunately arrived just as the day became thermic and we were able to spare people from the launchpoint to go down to the hangar. 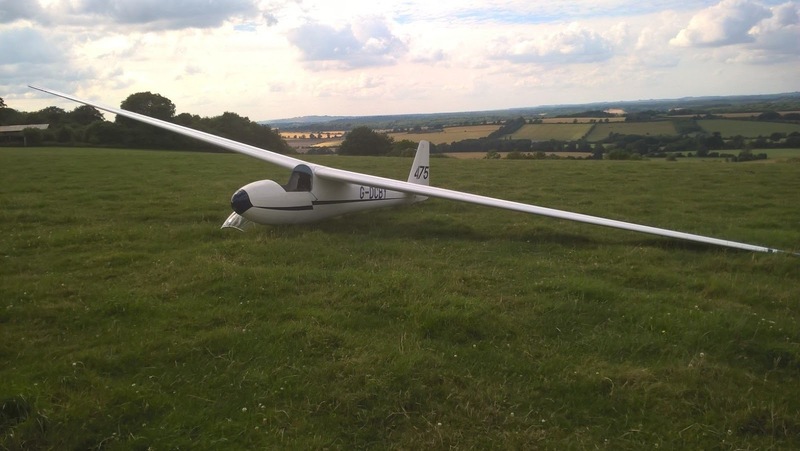 This doubled the launch rate and enabled club members and their guests to fly in HXP, whilst DMX was used for club training. 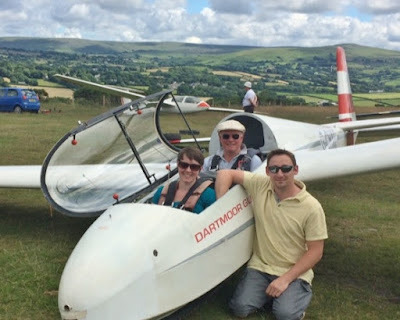 IFP Rick Wiles flew with One Day Course student Jane Green, visitor Jim Welch and member Simon Collier’s wife Lynn, whilst Martin Cropper flew with a fellow glider pilot from Rode Island USA Peter Flanagan. Ged Nevisky gave Mike Bennett some useful coaching ahead of next week’s Flying Week, whilst Colin Boyd flew with partner Karen Mather. Visitor Jim Welch also flew with Rick. flew with Martin Cropper (and Steve Lewis). 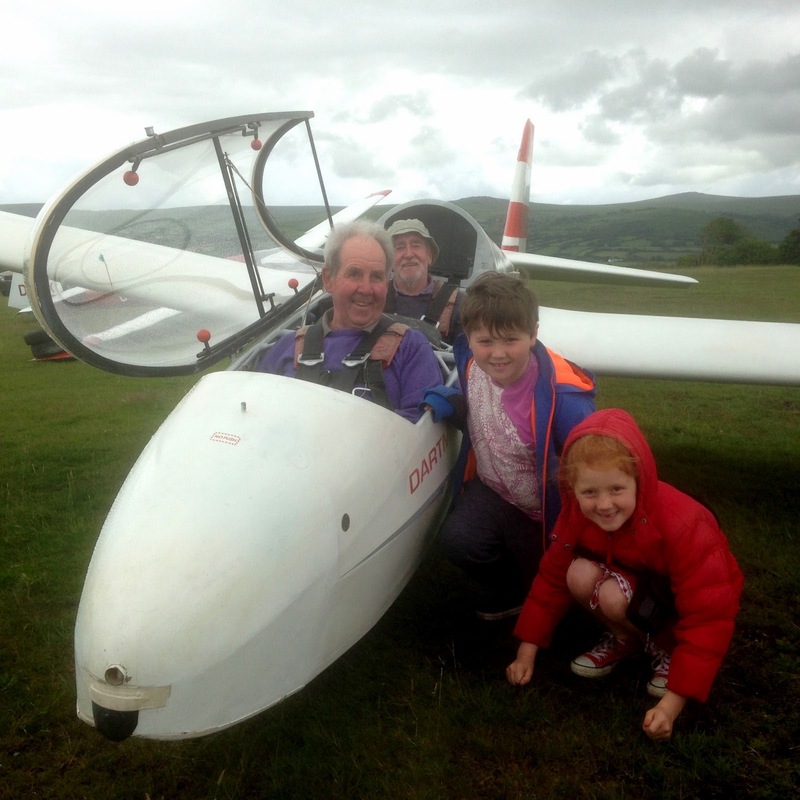 The onset of a convergence from the SW gradually put paid to soaring, but not before Steve Lewis had taken the K-8 to 3,600ft for a Flight of the Day winning 36 mins. 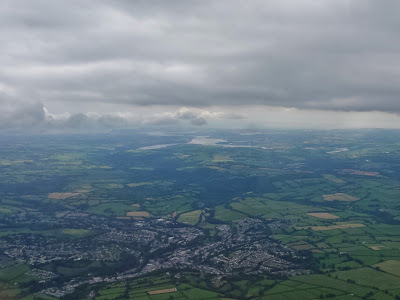 Steve Lewis’s view of the Tavistock and the River Tamar from the K-8 at 3,000ft. With 34 launches in the bag by 6:30pm it was declared to have been a very satisfying day. Thanks go to Colin Boyd, Dave Downton and the crew for getting DMX repaired and back into the air so quickly. Today was a day of two halves. flew on a 2 Flight Voucher with us. With HXP being the only K-13 available, there was no option but to devote it to our visitors (see photos) for the first half of the day, then chopping to club members later in the afternoon. 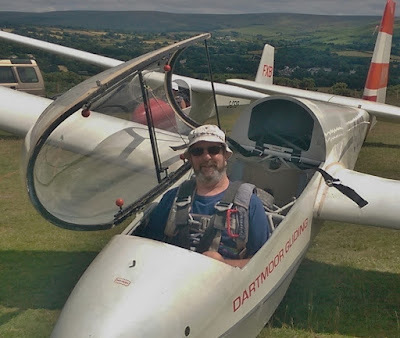 Fortunately, due to there being only a ‘slack handful’ of them (most needing only check flights), this worked quite well, and was assisted by Ged Nevisky putting his Twin Astir to use. 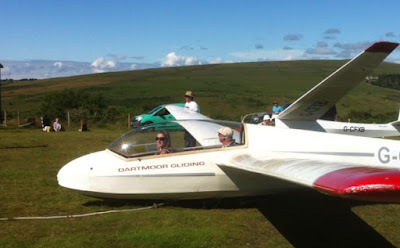 thought she was on her way to Padstow when she arrived for a flight at Brentor..! 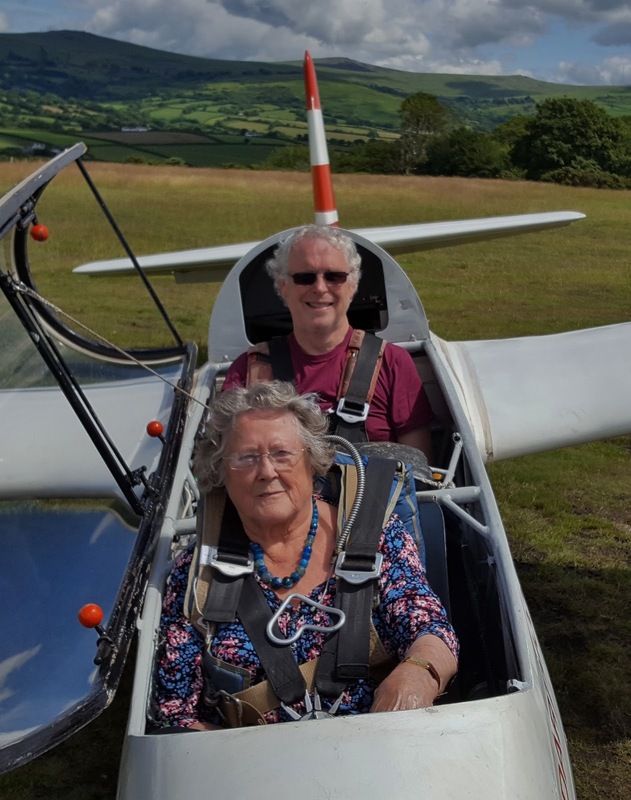 Rosemary Allchin, from Torquay, flew with Instructor Martin Cropper. We also welcomed a return visit by Seahawk GC’s trainee instructor Steve Moore, who was keen to get in some winch training (including the inevitable ‘break’). A good day in which we flew 24 launches. 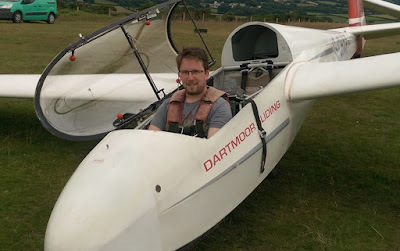 A few years ago, fairly soon after I had started gliding, someone gave me a book entitled ‘Kronfeld on Gliding and Soaring; the story of Motorless Flight’, tracing the earliest history of gliding, and following Robert Kronfeld’s own experiences with gliders up until the 1930’s. A fascinating book, and one which vividly conveyed the novelty, wonder and excitement of the early years. One expression in particular has always stayed with me, being quaint and very 1930’s. 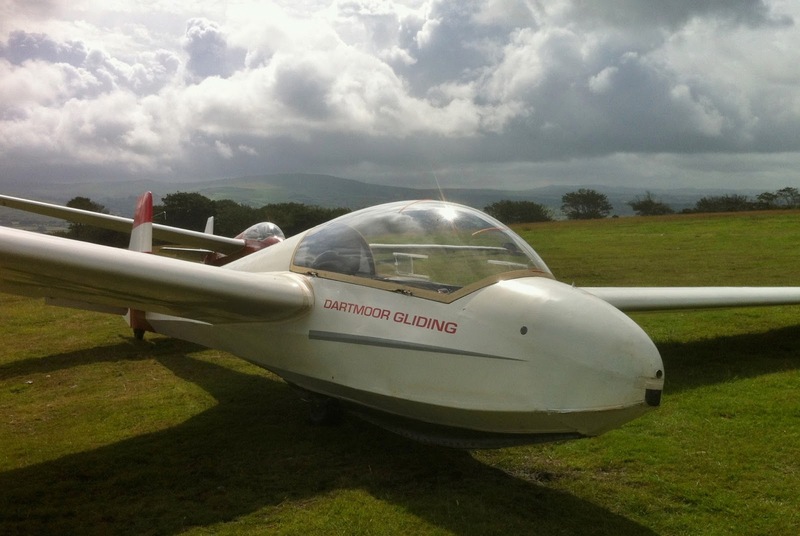 After having spent the day at Itford Hill in England, demonstrating to the British Director of Civil Aviation the ability of a glider to soar a slope, and with the watching public starting to go home, Kronfeld asked Mr. Gordon England, the organiser, whether I could go wandering. Kind of an open ticket to an unpredictable adventure! 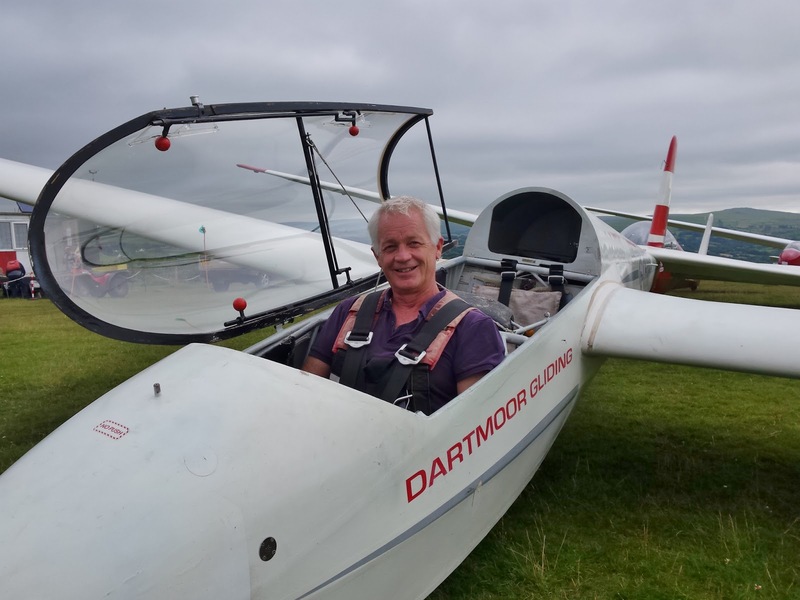 The first ICL weekend at Upavon went unexpectedly well; DGS, a club without much previous involvement in the ICL, got points on the board, had some good flights and contributed to a thoroughly enjoyable weekend. The second at Keevil fell victim to the British weather, and so the last ICL event for 2016 was at the Park; as it turned out the team would be the same as before, Roger Green Pundit, Richard Roberts Intermediate and Roger Appleboom Novice. Richard Roberts, impeccable General that he is, got there first - camping on Friday night on what appeared to be a 30 degree slope. The ground crew, Adrian Irwin and Leith Whittington also pitched up on Friday, Leith having pinched his wife’s camper van for the weekend and Adrian having booked in at a luxury B&B befitting his status as ex RAF. I turned up early on Saturday morning, K6 in tow. The first disaster of the weekend was a call from Roger Green, our Pundit, saying he couldn’t make it because of glider problems; ouch - points scoring chances down 33%! The weather was also doing no-one any favours, with early forecasts looking slightly optimistic. After the 10 o’clock briefing club flying commenced, but no-one was staying up even into the late morning. 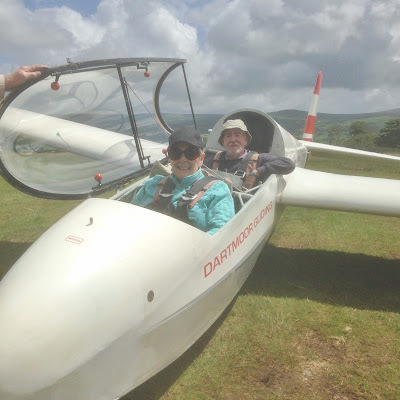 There is something forlorn about glider pilots standing by rigged and ready gliders, one eye on the sky and the other on the relentlessly ticking clock. With a 170km task - the Park, Trowbridge, Newbury South, Bradford-on-Avon, the Park - the last two legs into wind and soaring conditions only reasonable to the east, we needed to get away by 2 o’clock. Richard was one of the first to make the decision to take an aerotow to 3000ft and use the height to break clear of the Deverills. 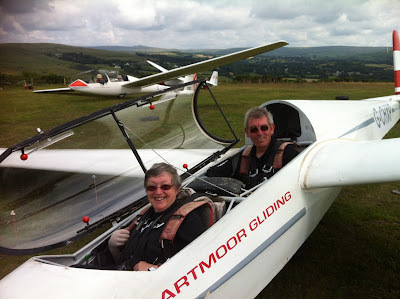 Decision made, there followed a mad dash to get on to the aerotow line and get away; Richard at 1.30p.m., me at 2.10p.m. No time for any consideration about getting back, just a vague plan to go north until Trowbridge, turn right, go east towards Newbury, and if I got there turn around and come back again; pretty good plan for those of a wandering nature. 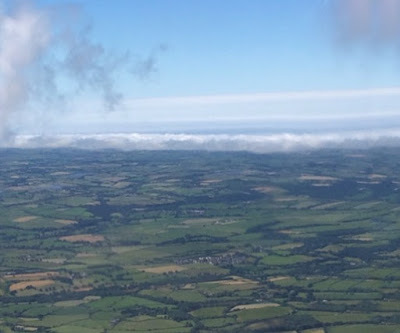 I released from the aerotow at 2,500ft, pointed directly north keeping left of urban blob 1, Warminster, and left of urban blob 2, Westbury, arriving over Trowbridge at a slightly lower height than was comfortable. Instead of turning immediately I continued north to a promising cloud where there was hoped-for lift, and at a respectable 3000ft, cloud base, I finally nosed east, following the Kennet and Avon canal; and following, it would seem, an interesting line of sink which I told myself would eventually end if I held my nerve and kept going. There is, south of Melksham, probably at Berryfield, an industrial estate on which there is a large factory with a steel roof - Avon Rubber plc. I had set the altimeter to QFE at the Park, so the 300ft it showed as I approached the factory didn’t reflect my true height above the ground, but it did confirm that I was in a spot of bother. There was, however, a large field adjacent to the factory so, with the prospect of lift, no matter how meagre, from the roof gleaming in the sun, and with a get out of jail card next door, I felt I had another throw of the dice. 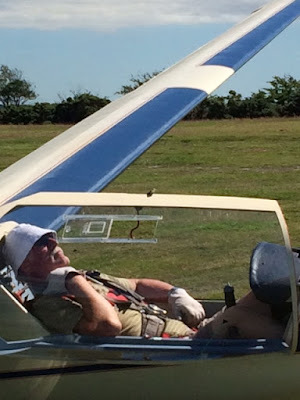 Sure enough there was enough rising air to arrest the glider’s descent. Thermalling in weak lift, I noticed a flock of seagulls over a smaller factory to the north, adjusted the angle of bank to join them, and got into strong lift that funnelled us all to over 3000ft; reprieve - clever birds! Google Earth shows ‘G Plan Upholstery and Sofa Brand International’ are housed in the factory - hot stuff. 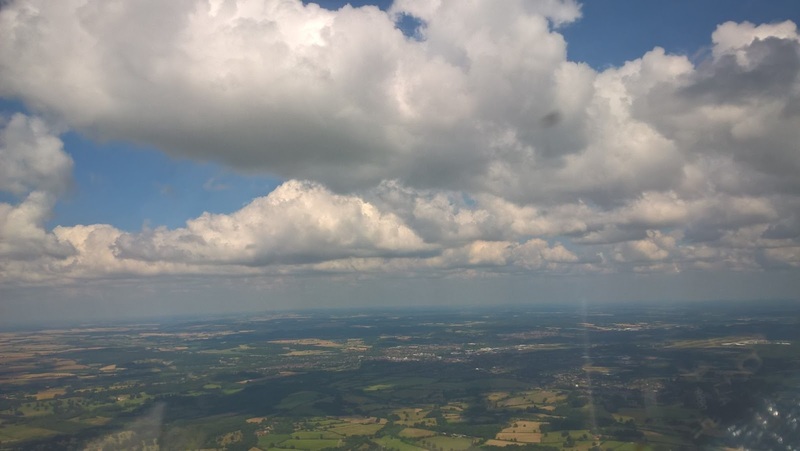 The flight eastwards from Melksham was fairly predictable, flying from cloud to cloud, long glides between good areas of lift, with the wind drifting us eastwards whilst thermalling. Newbury appeared about where it should have been, the turn point (or what I thought was the turn point!) was reached, a nearby cloud was used to top up with a bit of height, and with 2,500ft showing I turned west and headed for home - not doubting I would complete the task. Against the wind, thermalling was drifting the glider backwards, and a few hundred feet gained was lost getting back to the start of the weak lift. Limping from one potential land-out field to the next I was sure all other gliders were back home, pilots enjoying a beer, waiting for the BBQ to be lit. 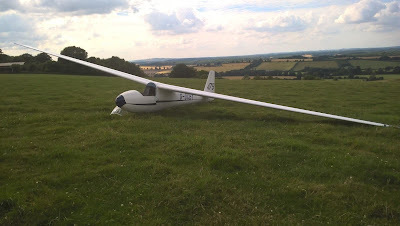 Rivar Hill Gliding site appeared on the ridge to my left, gliders still winching….. and I was below their release height - an impromptu visit was tempting but I plodded on. 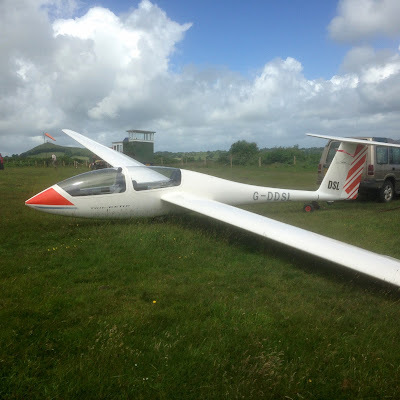 A few minutes, and several hundred lost feet later, the gliding site looked increasingly attractive. 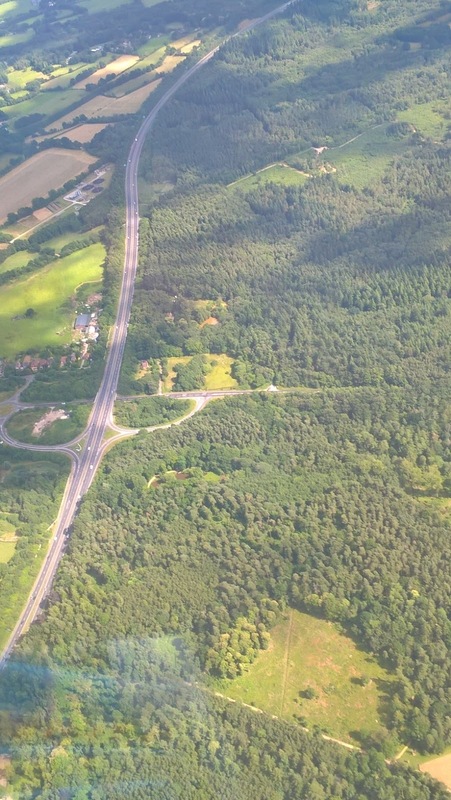 Decision made; the approach, I had noticed, was grass field sloping upwards, fence, track, fence, crop, line of trees, airfield; OPTIONS! I doubled back, turned south towards the airfield, height marginal, gliding site partially hidden by the trees wasn’t good, crop looked high, grass field in front seemed fine, this was a no brainer. 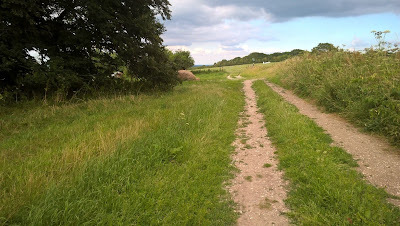 I landed uphill towards the top of the field. The landing was fine, K6 unscathed, prospects for the BBQ less so; and I thought I was going to get back this time! For a time things seemed to take a turn for the worse after such a gentle touch-down. It was discovered that the gates were locked, with ‘Beware of the Bull’ signs displayed to discourage trespassers, the track was a bridleway - rough, unmetalled, impassable to a motor car let alone a low-slung glider trailer. There was no phone signal and when I did get through to the club, found that Adrian, my retrieve, had never towed before. A long unstable trailer behind an antiquated Renault van through Wiltshire’s single track lanes was probably not the best way to learn. Worse still, I was assured by the members of of Rivar Hill Gliding Club that the farmer who owned the field was of the unsympathetic kind who chewed pilots’ heads off and displayed them around the farm to discourage other unwanted intrusions: “Good luck” they said when furnishing me with his name and address. Mere setbacks, hurdles to be straddled, adding to the memories of a gloriously fascinating day! And so to the credits, the obvious conclusion to any good story……. To Richard Roberts, for organising DGS participation, helping, encouraging and nurturing the crew, and generally leading by excellent example. To the ground retrieve crew, Adrian Irwin and Leith Whittington for their help in rigging and retrieving, and their constant good-natured banter which made the weekend so special. 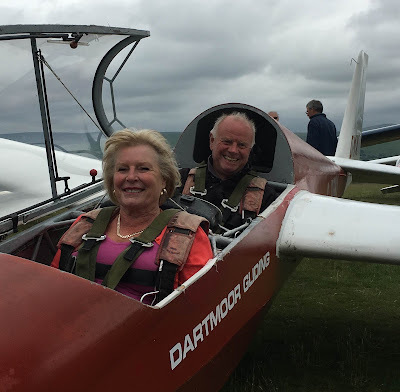 To the Bath, Wilts and North Dorset Gliding Club for hosting the event, and welcoming visiting pilots with such generosity of spirit. To farmer Hosier - not the expected ogre but a real gentleman, for interrupting his supper to drive up and unlock the gate. 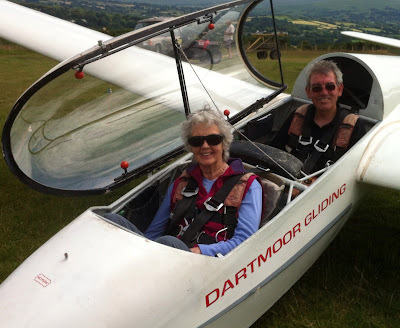 To Brangwy, a 55 year old glider who glossed over the deficiencies of her pilot, so the two could enjoy the pleasures of meandering over the Wiltshire countryside. And of course, to a family of seagulls who got me out of the poo by marking a thermal over Melksham; Never again will I ponder the delights of Herring Gull pie. It was a cross-country flight more ‘Kronfeld’ than ‘Eckey’, but then,wandering is merely a frame of mind; roll on next year’s ICL. When I get so rich and famous that I receive an invitation to share my seven favourite records with the Great British Public on Desert Island Discs, I won’t have anything so common as the ‘Shipping Forecast’ with all that North Utsire/South Utsire malarkey, no just a plain “the area lies under a ridge of high pressure” will do for me (for its rarity value). Today, however, we had that privilege. So with the sun beaming down from a cloudless sky, and humidity levels much lower than yesterday, a north-westerly zephyr and two K13s on hand, we set out to achieve as much as practicable for as many as possible. Our One Day Course student Kevin Wilkins, who is a printer from Plympton. Forty nine launches later the sun continued to beam down from a cloudless sky, but in between we had experienced some classic soaring conditions, decaying gradually as a sea breeze crept in from the north (or possibly west) coast. Roger Appleboom was kept busy all day, being first to launch with One Day Course Student Kevin Wilkins (see photo) followed by a string of other visitors (as illustrated) adding 10 launches to his log book. Visitor Ann Barriball is ready to launch with Roger Appleboom. 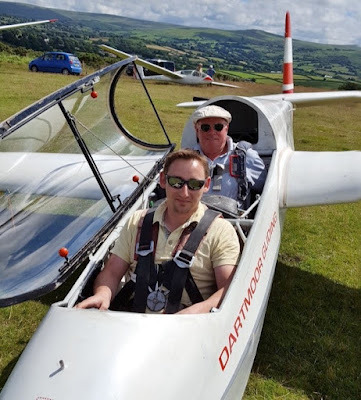 Trainees Dave Downton and Ed Borlase benefited from some much needed launch failure practice, whilst new member Phillip Sellwood was at last able to get a decent set of flights after his One Day Course a couple of weeks ago. Peter Howarth led the march to the K-8 (to be followed by Allan Holland (53 mins) and Joe Nobbs), whilst Tony Dean was struggling to get the Twin Astir out of its T hangar (and eventually managing 43 minutes in the air – result! 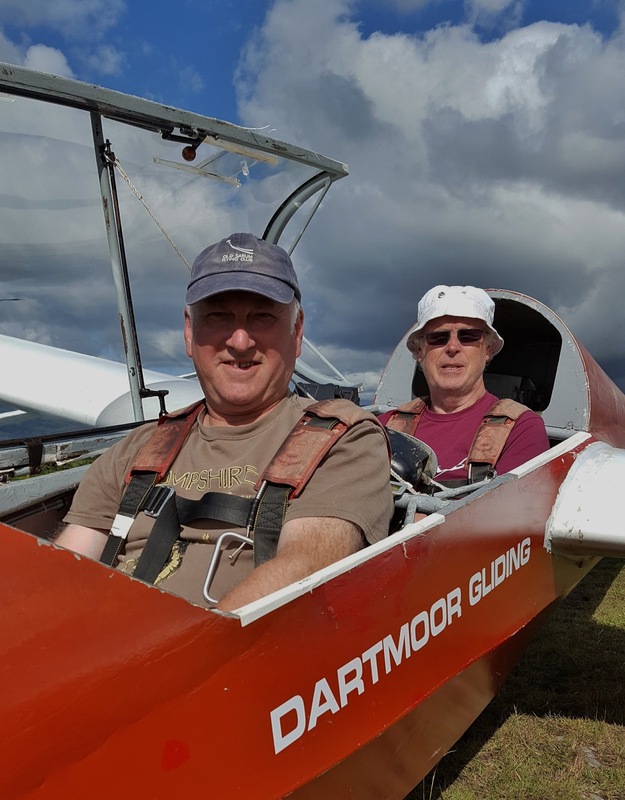 ), Standard Cirrus syndicate members Pete Harvey and Chris Owen enjoyed showing off their steed whilst Leith Whittington failed to line the Treasurer’s pockets with a modest 3 launches this week. Leith Whittington counting his soaring minutes whilst awaiting a cable..! 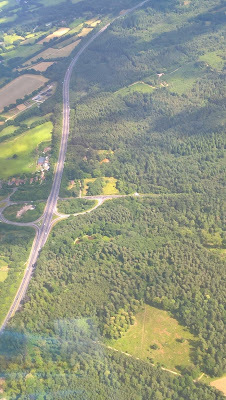 Flight of the Day award was emphatically taken by Rich Roberts in his K-6CR who, constrained by having to attend Afternoon Tea with his family at 4pm, managed to fly north of Roadford reservoir (see photo of the N coast), Lifton and back whilst eventually achieving a height of 3,500ft by climbing up the edge of a cloud – “but low down - between 700-1,300ft - it was hang on in there and wait”, he reported afterwards. Thanks go to the enablers – Roger Green and Heather Horswill on winch and retrieve (as relieved by Allan Holland and Jeff Cragg) and the launchpoint crew, including Eliot Acton and Ed Borlase. 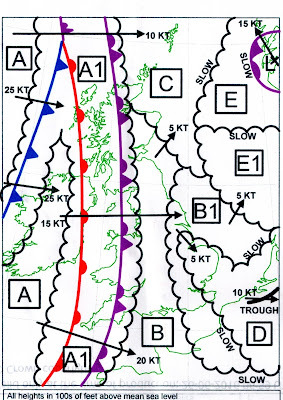 The forecast gave a cloudy start gradually giving way to sunny periods with a 6 knot SW breeze and a 20% chance of rain. What we actually got was cloud nearly all day, no rain and the 6 knot breeze was from the west. 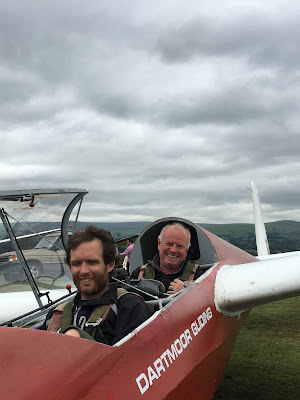 We made the best of this training day with Rick Wiles flying our One Day Course candidate Mathew Shaw while I flew our Air Experience visitors Mathew Hut and Ifan Kaidain and Ged looked after the club training. 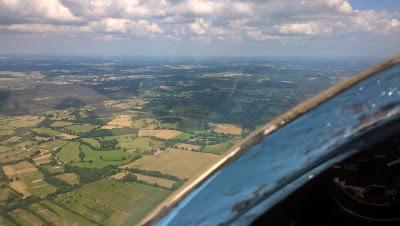 It never really became soarable but there were a couple of extended flights between 11 and 13 minutes. 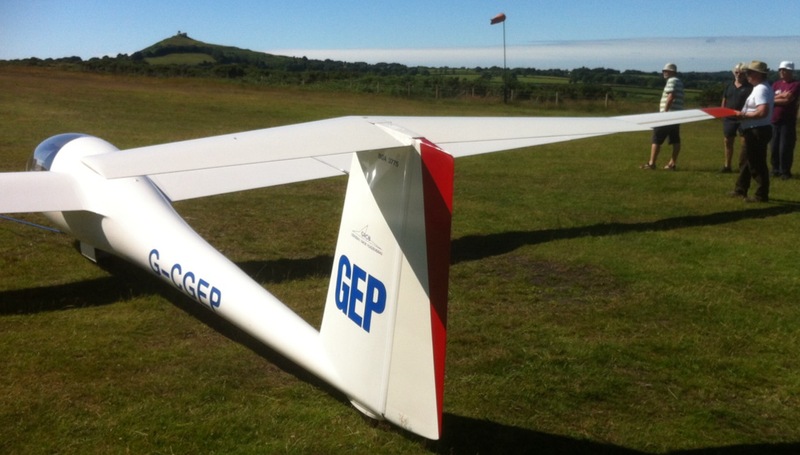 Later in the afternoon a convergence approached the airfield from the south but it never got within gliding range. “Better to have tried and lost, than never to have tried at all...” was definitely today's motto for, under the leadership of Gordon Dennis, whilst fainter hearted fliers would have left the gliders in the hangar, we made the best of typical UK summertime conditions until the crosswind forced us to declare. The K-13s wait to be launched under an interesting sky. With a good turnout and three visitors to fly (most under our Two Flight Voucher Scheme), the kit was out checked and ready to go early, which was just as well as either low cloud, rain showers or increasingly strong winds threatened to make the day unflyable. 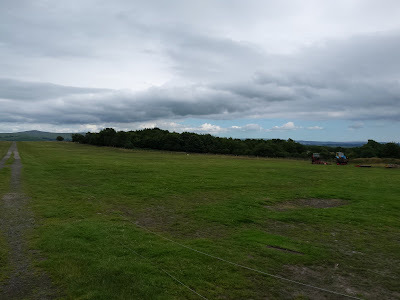 In the event it was the direction of the wind, not its strength, that made us put discretion before valour for, despite the gliders laying off and having moved the winch to the SW corner of the field, the winchman was unable to recover the cable with sufficient margin for safety. 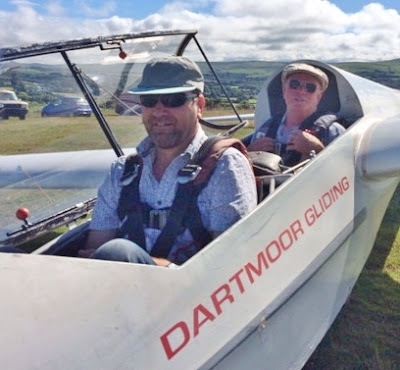 That was not before we managed to fly our first visitor of the day, however, Dennis Neville, from Plympton, formerly a fireman with the GWR and LMS, who flew with Roger Appleboom, whilst trainee Dave 'The Voice' Downton flew with Gordon. 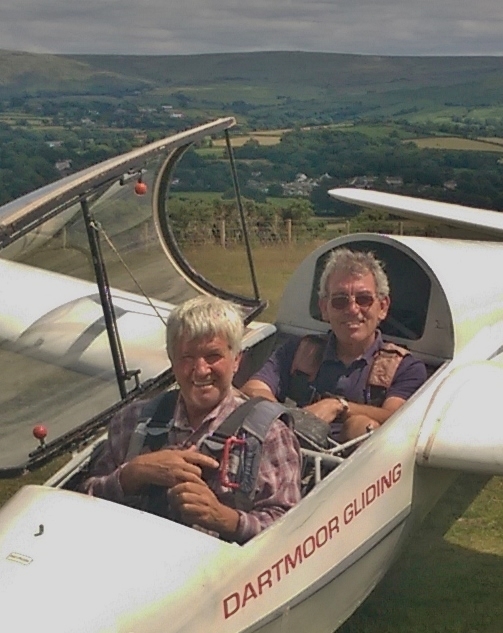 Dennis Neville, from Plympton, flew with Roger Appleboom on our 2 Flight Voucher Scheme. Today's weather started badly, continued badly and ended in the same mode. 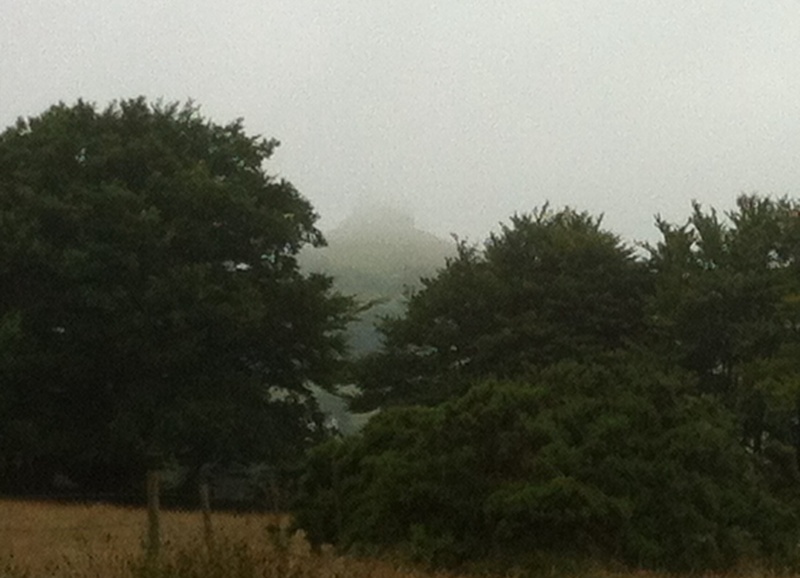 The cloud base never got as high as the tree tops and there was endless drizzle. So a non flying day. We had a One Day Course booked for today and, even though it was unflyable, Tom Bevan came to the airfield with his family. He was given a guided tour, the safety briefing and, after some refreshments, had a session in the Simulator with I.F.P. Mike Jardine. At 9am, with cloudbase (just) managing to skeeter over the tops of the tors, and relatively benign forecasts from the Met Office and RASP; plus two K-13s being back in harness (huge thanks to Colin Boyd and the team for getting HXP through it's CofA last Wednesday), there was everything to play for today. 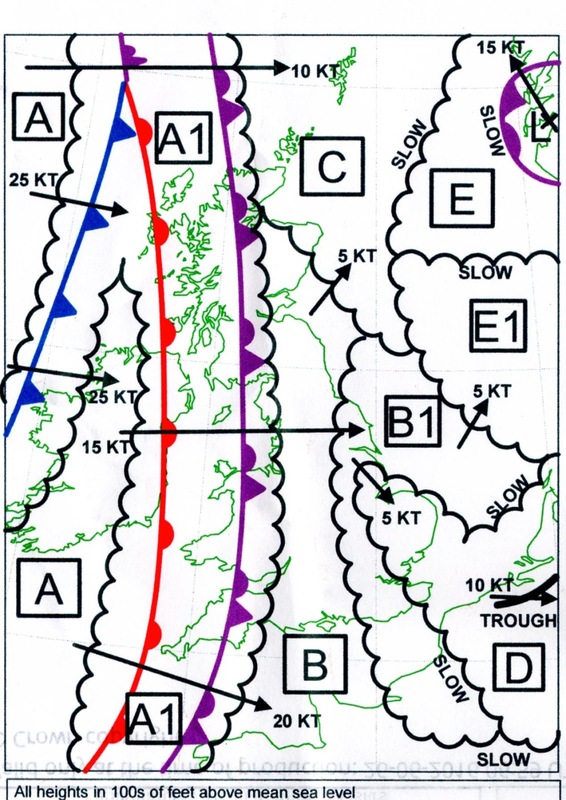 With 'Light Airs' characterising the wind at the start, we set up for a westerly launch, which proved correct as the wind eventually settled in the NW'ly quadrant, remaining light throughout. 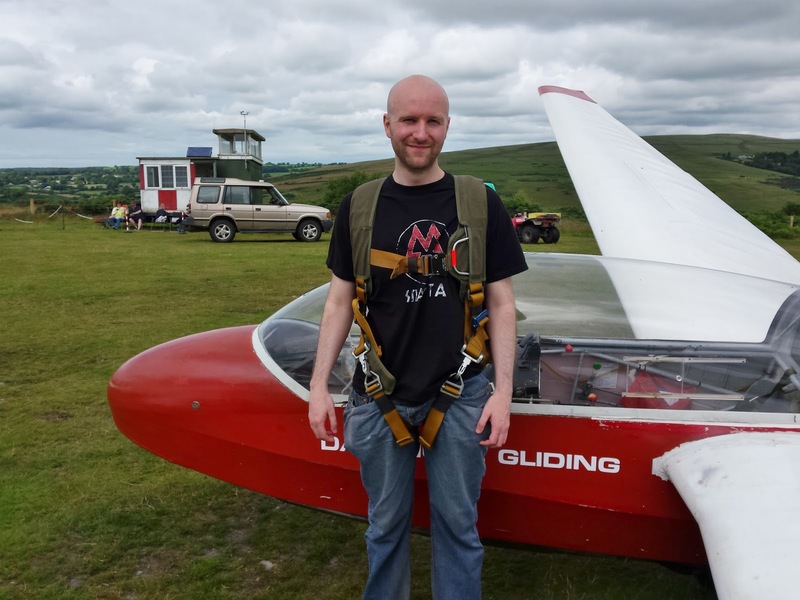 One Day Course student Phil Selwood from Shebbear. 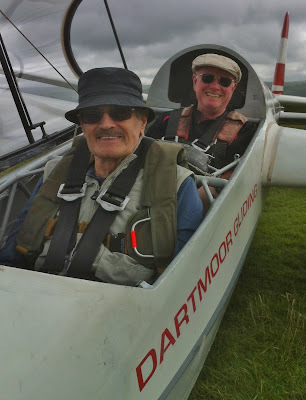 Our One Day Course student was Phil Selwood, a gunsmith from Shebbear, who flew with Peter Howarth (see photo) and, as a radio controlled model glider pilot, caught on quickly. 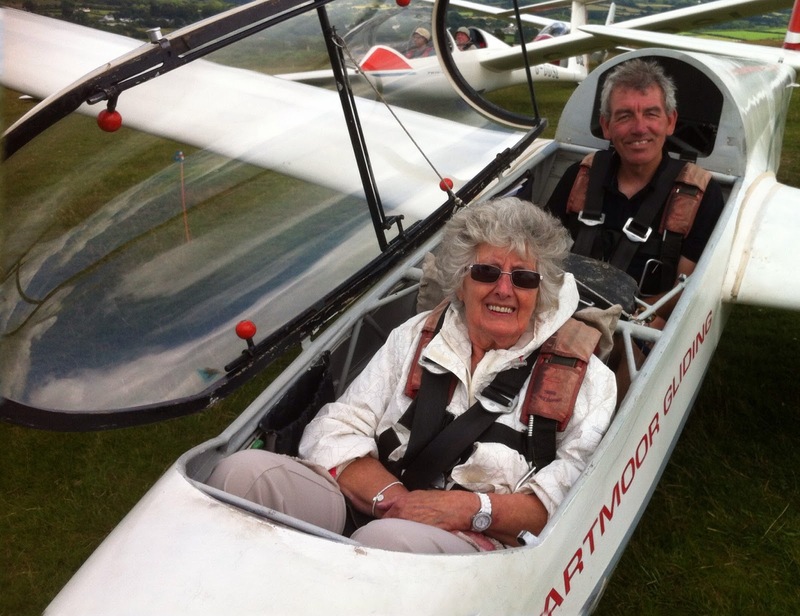 Peter also flew with Jill Bracey in K-13 HXP (see photo), whilst club trainees Jeff Cragg, Dave Downton and Ed Borlase flew in K-13 DMX. Visitor Jill Bracey flew with Peter Howarth. So, what of the conditions? Well, initially, everything went to plan: the sun broke through, the cloudbase lifted, little white Cu began to populate the skyscape, even beginning to organise themselves in cloud-streets as, in the words of Chris Owen, “I flew through pockets of lift, managing 2,300' QFE, achieving a very pleasing 37 mins flight time”. Chris's flight took place at around 2:30pm, ie. one hour after Adrian Irwin's Flight of the Day Award winning 53 mins, and shortly after which a door to further soaring seemed to shut. Which was difficult to account for since, as the background in our photo of Leith Whittington's superb Dart 17 shows, the sky was still peppered with cumulus, as a hard edge of cloud formed to the south and east of the field. If this was a convergence then a. it didn't generate any lift and b. it must have come from the north coast. What ever it was, climbs which before lunch had been smooth and easy became very narrow and difficult to work. 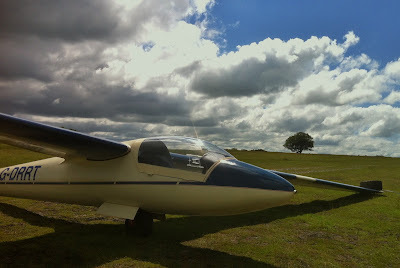 The afternoon sky behind Leith Whittington’s superb Dart 17R. 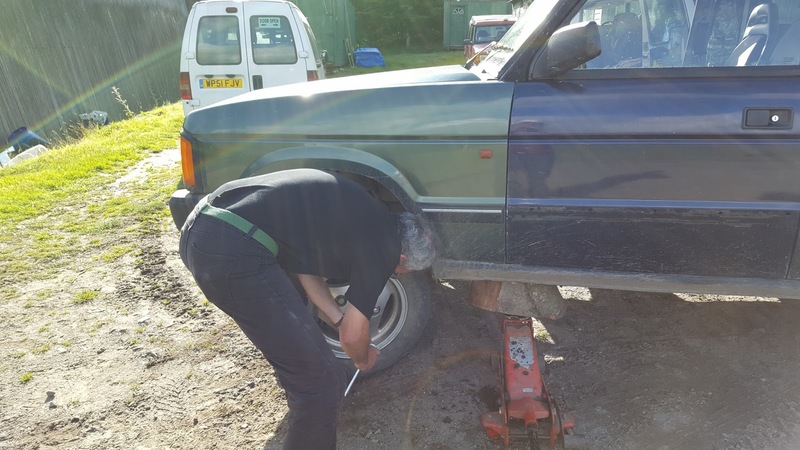 And so with just a quick burst valve on one of the wheels of the green Disco thrown in to remind us that this is a gliding club where the untoward is regular and innovation often required to fix it (see trolley jack in photo), by 7pm we were able to call it a (quite rewarding) day. The weather was best described as variable. Showers, some heavy with the wind moving from west to north and the wind gusting from 5 to 20 knots. Most flights were extended in the buoyant conditions but longer flights were curtailed by the next shower. 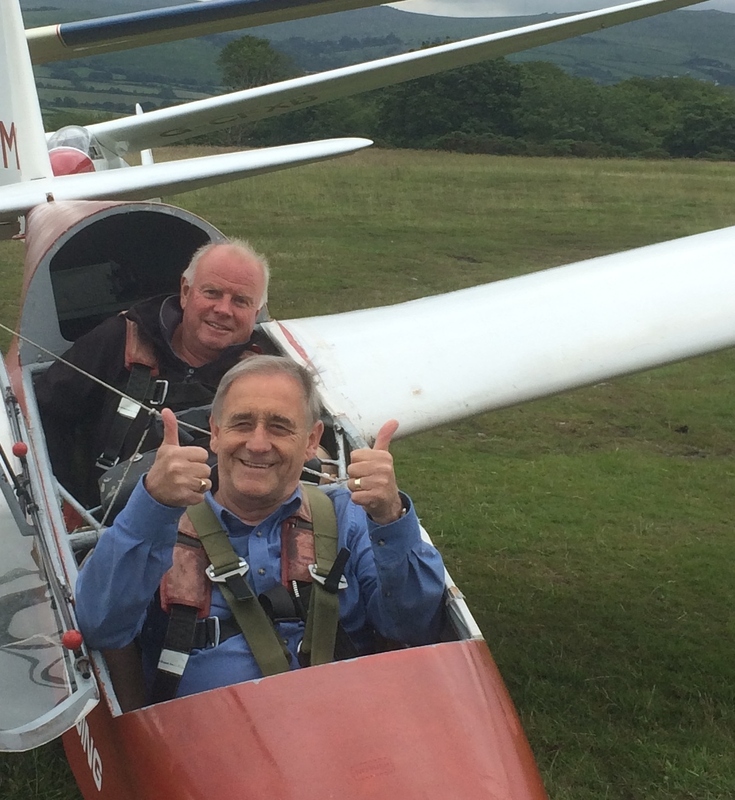 Longest flight of the day was 45 minutes by Ged and Tony in the Twin Astir. In fact the average flight time for the day was over 17 minutes. Our visitors today were husband and wife Graham and Judith Harding who both flew with Ged as did our other visitor Kenneth Kendall. 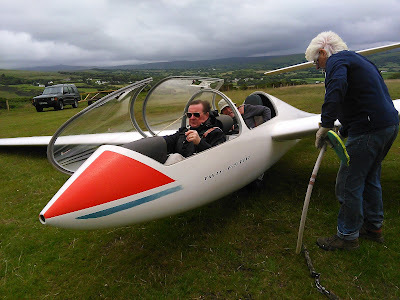 The big news today was that Tony Dean has finally managed to fly the Twin Astir after buying a share many, many months ago. After a couple of familiarisation flights with Ged, Tony flew it solo for a very creditable 42 minutes. Tony was pleased; this was the first time in 34 years that he has flown a glider that he owns ( part owns actually). Strong westerly wind ensured good height launches. Today's visitors were Guy and Dominique from the Bathurst Gliding Club near Sydney,who are personal friends of our Field Treasurer Robin. They both flew with Ged in his Twin Astir, experiencing their first winch launches even though they are both experienced glider pilots. 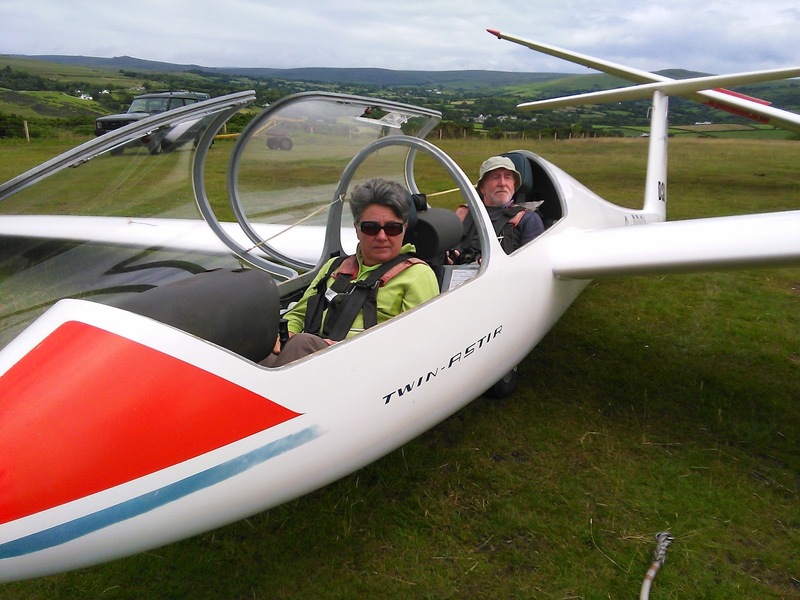 Everyone flew but thermals were difficult to find with only one soaring flight recorded. “Well it appears that Saturday is now the best day of the weekend...” moaned Roger Appleboom as we surveyed a grey and damp skyscape at a little after 2pm, in the knowledge that yesterday's crew had managed over 20 launches, starting at what can only be described as a French lunchtime. The Met Office Forecast for today. Well, looking at the Met Office prediction for 1pm local (see photo), it was amazing that we flew at all. It was a case of 'Why bother' vs. 'Wossup?' for, whilst the forecast predicted 'carnage', as our photos show we were able to fly until such time as the rain eventually forced us to beat an honourable retreat. And so we managed to meet our visitor/trial lesson commitments. (as shown in the photos), but (with the exception of Dave) And so it is with a heavy heart that we have to thank Martin Broadway, Leith Whilttington, Jayne Smith and partner Dave, Chris and Eliot Acton, Barry Green and Heather Horswill, and commiserate with Leith Whittington for not beating Martin Cropper to the flight of the day (which, at 10 mins, was no great achievement). 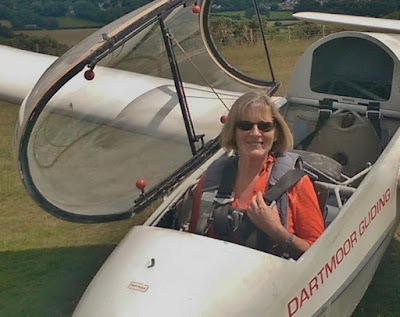 Visitor Sandra Maddigan flew with IFP Roger Appleboom. before conditions prevented further flying. 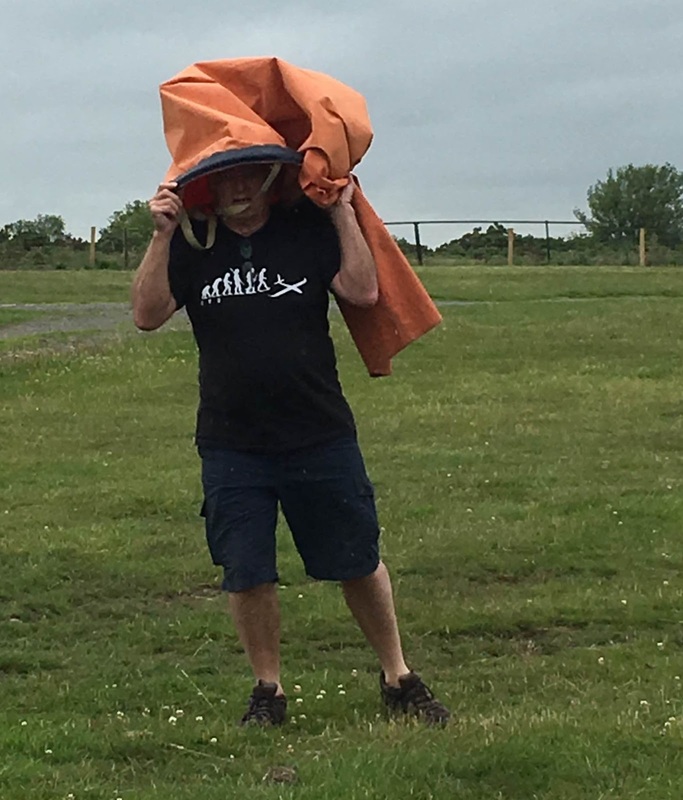 And so, by 2pm, and after 15 launches, as the rain drops on the occlusion finally arrived, we had to concede to the weather and admit that some flying was definitely better than no flying! As we left the field, we appeared to be followed by a strange being in a Gandalf-like flourescent hat. 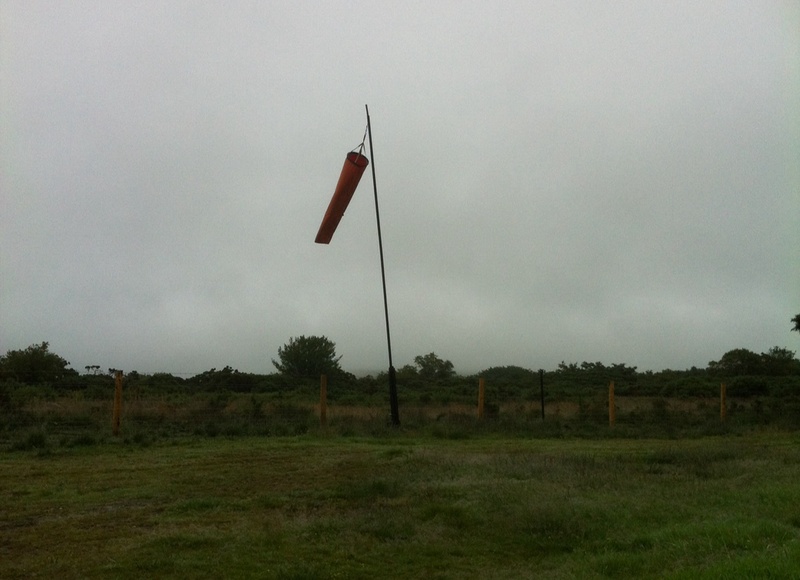 As he got closer though, we realised that it was only Dave Downton using one of the windsocks as an umbrella! !